Sum of all varied activities during the annual growth cycle in the vineyard with appropriate tools and systems to physiologically mature and healthy grapes as a base for high quality wines to obtain. A commonly used buzzword is "The quality of wine already decides in the vineyard" sometimes with the addition "The measures in the cellar are limited to controlled ( non-invasive ) Do nothing". It's not that easy, but there's no doubt that failures and mistakes in vineyard management in the cellar are difficult or impossible to remedy. Increasingly, many producers around the world are sustainable Production forms like Organic (organic) viticulture with the special forms Biodynamic viticulture and Bioenergetic viticulture for the protection of ecological Balance, promotion of beneficials and conservation of biodiversity (Biodiversity) applied. These give strict guidelines. 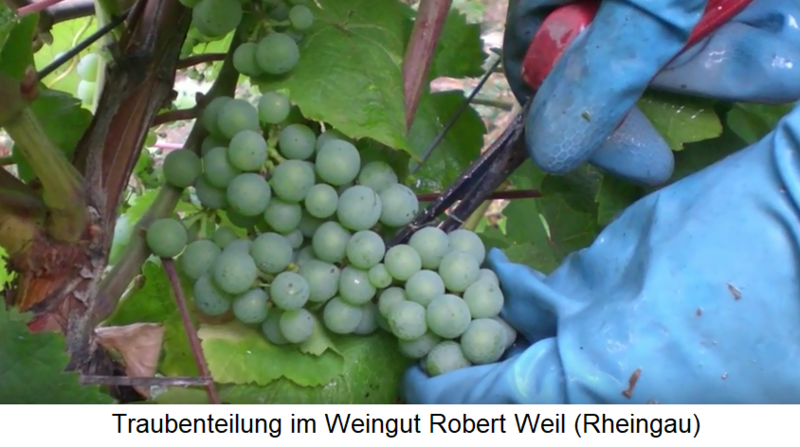 of pest Management and the related fight against Vine enemies (Pests) with restrictive to prohibited use of pesticides, as well as the Rebstock- and floor care with allowed fertilizers in front. This page was last modified at 13 June 2018 at 15:30.